Nice post!! I missed the bit about 13 months. Good catch. 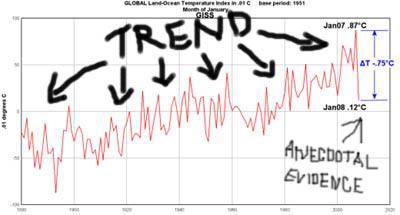 What I really don’t get, as noted in my own post, was how this guy can look at a perfectly good graph of temperatures showing that the coldest point in the last 20 years or so is still warmer than the warmest point from 80+ years ago and say that a single year erases all of that warming. In 1977, the U.S. Congress created a National Committee for the Protection of Human Subjects of Biomedical and Behavioral Research to investigate allegations that psychosurgery — including lobotomy techniques — was used to control minorities and restrain individual rights. It also investigated after-effects of the surgery. The committee concluded that some extremely limited and properly performed psychosurgery could have positive effects. By the early 1970s the practice had generally ceased, but some countries continued small-scale operations through the late 1980s. In France, 32 lobotomies were performed between 1980 and 1986 according to an IGAS report; about 15 each year in the UK, 70 in Belgium, and about 15 for the Massachusetts General Hospital of Boston. Of course, this lack of lobotomies completely fails to explain observable human intelligence, or lack thereof, in the U.S. Personally, I’d rather have a free bottle in front of me than a prefrontal lobotomy. Sorry, the two paragraphs following the wikipedia link were supposed to be quoted. The last two sentences are, quite obviously, not from wikipedia. This is an extremely important point you’ve brought brought up on your blog, and one I can’t emphasize enough. Thanks for mentioning it.